A Fantastic Friday Lunch | Keep It Up, David! In a recent post, I mentioned that on Friday, my dear friend Kristy Hanson came over and we hit the gym and had a killer workout. Then she came over and we made lunch. What I didn’t share in that post what we had for lunch… but that’s what this post is for! It was a delicious meal, and I took pictures. In addition to being delicious, this meal was quite noteworthy because there was a lot of experimenting going on. You know how much I love trying new things, right? Well, this meal involved not one, not two, not three, but FOUR new things! FOUR! I was in hog heaven. NEW ITEM #1. About a year ago, I started noticing vegetables in all sorts of strange colors. Naturally, I bought every oddly-colored vegetable I could find! I was diligent about blogging about them, too – so click these links for pictures of rainbow carrots (and more rainbow carrots here and here), Easter egg radishes, black radishes, orange cauliflower, purple bell pepper, and white eggplant. It’s been a while since I’ve seen an oddly-colored vegetable. Until the other day, when I picked this up. 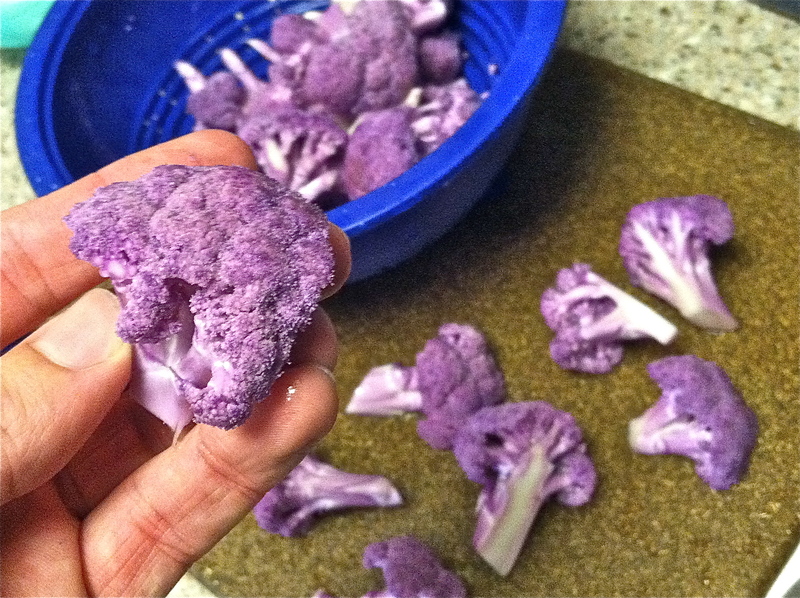 It’s a purple cauliflower! I charged Kristy with photographing the bottle, and she opted to create a floating bottle illusion, which I love! The sauce is a super concentrated garlic puree – it smells incredible! There’s only five listed ingredients: garlic, onion, vinegar, salt, and spices, and one serving (a teaspoon) has no calories and no fat. We added about a tablespoon to a skillet slicked with non-stick spray, and added the chicken to it. NEW ITEM #4. Fake pasta! I’ve been seeing this item at Whole Foods for a while now, and finally gave in and bought some. It’s a tofu-based pasta alternative – this variety is spinach fettuccini – and that entire bag (2 servings) has 50 calories and 0 grams of fat (it’s zero Weight Watchers points, for those of you that do Weight Watchers). It’s super easy to prepare: cut open the bag, drain it, rinse it, and heat it up – either in hot water, or you can do what I did, and clear a space in the veggie skillet, and add it in. Be warned: the fettuccini strands tend to clump together, so use a fork or something to tease them out a little bit before you add them. The cooking of the entire meal was quick – about 10-15 minutes in two side-by-side skillets (I would’ve taken photos but my stove is in the dark corner of my kitchen). Then we plated it up, and dug in! It was delicious. The garlic-sauced-chicken was flavorful, and the veggies were perfect. The apricot dijon sauce was a little sweet and had a great mustard kick. The fake pasta was good – I don’t think you could be fooled into believing it was real pasta, but Kristy pointed out it was very similar to texture and taste to sobu noodles, which are often used in Vietnamese and Thai dishes. The pasta helped round out the dish, and absorbed the sauce nicely. The best part? Kristy and I each ate a big plate of food, and there was enough leftover for a big, tasty dinner. PS – If you didn’t have time to visit Keep It Up, David over the weekend, than you missed out! I blogged both days over the weekend, so click on these links to read about an unexpected run and the new skyscraper I added to my collection! This entry was posted on Monday, February 13th, 2012 at 1:35 am and is filed under Uncategorized. You can follow any responses to this entry through the RSS 2.0 feed. You can leave a response, or trackback from your own site.